2017 has brought some new drug approvals, as well as new dosage updates for a number of medications. Medication spending continues to rise this year and is expected to increase 4-7% by 2021, according to a report released by QuintilesIMS. This would mean in the United States alone, Americans will be spending $580-$610 billion. Our current expenditure is on track to be upwards of $360 billion for 2017. Drug prices in the United States have also continued to rise, in some cases as much 11% compared to last year. All of this is in direct contrast to the stagnation in wages as they rise only 2.5% nationwide. President Trump had vowed to bring drug prices down, but so far this is a campaign promise he has yet to fulfill. Used for: Xadago is a monoamine oxidase (MAO) inhibitor, type B. It’s given to people with Parkinson’s disease. It can be given with levodopa and carbidopa to treat “wearing off” periods that lead to muscle stiffness and loss of muscle control). It works by allowing the chemical dopamine to work in the brain for a longer period of time. Used for: Bepreve is an antihistamine eye care drop used to reduce allergy symptoms such as itchy or watery eyes. It works by reducing the level of histamine produced by the body that cause the allergic reaction in the first place. Used for: Keppra XR is an anticonvulsant (anti-seizure) medication used to treat partial onset seizures in children over 1 month old, and adults. In our online pharmacy, we currently only carry the generic medication manufactured by Torrent Pharma. Used for: Renvela is a phosphate binder used to prevent hypocalcemia (low calcium in the body), caused by elevated phosphorus. It is also used to control phosphorus levels with people who are on dialysis and suffering from chronic kidney disease. Used for: Tagrisso is another anticancer medication, but it’s used to treat a certain type of non-small cell lung cancer. It’s typically given after other cancer medications have been tried and yielded little or no success. It works by interfering with the growth and spread of cancer cells throughout the body. Used for: Binosto is an effervescent tablet used to treat women who suffer from postmenopausal osteoporosis. It works by altering the cycle of bone formation and breakdown by slowing bone loss, and increasing bone mass. Used for: Oxistat is an antifungal medication used to treat skin infections such as athlete’s foot, jock itch, and ringworm. It works by fighting the infection caused by fungus. It is the first generic cream approved to treat such infections. Used for: Ibrance is an anticancer medication, used to treat certain types of advanced breast cancer when its spread to other parts of the body. It works by interfering with the growth and spread of cancer cells throughout the body. It can also be used in combination with hormonal medicines such as letrozole and fulvesrant. Used for: Taltz is an immunosuppressant medication used to treat adults with moderate to severe plaque psoriasis (raised, silvery flaking of the skin). Eli Lilly is also hoping to have the medication indicated for use with psoriatic arthritis (PsA), like its competitor Cosentyx. It works by reducing the body’s natural response that causes the inflammation in the first place. Used for: Inflectra is used to treat rheumatoid arthritis, psoriatic arthritis, ulcerative colitis, Crohn’s disease, and ankylosing spondylitis. It may also be used to treat sever or disabling plaque psoriasis. It works by reducing the body’s natural responses that trigger inflammation. Used for: Enbrel is a tumor necrosis factor (TNF) blocker. It’s used to treat patients with rheumatoid arthritis, psoriatic arthritis, or ankylosing spondylitis, and prevent any joint damage caused by these conditions. It can be used to treat polyarticular juvenile idiopathic arthritis in kids at least 2 years old and plaque psoriasis in adults and kids over four years old. It works by decreasing TNF, a protein produced by the immune system to fight infections, but in people with immune disorders, the body produces too much and mistakenly attacks healthy cells. Used for: Clinoril is a nonsteroidal anti-inflammatory drug (NSAID) used to treat inflammation in the body caused by arthritis, ankylosing spondylitis, tendinitis, bursitis, or gout. It works by reducing hormones in the body responsible for causing the inflammation. 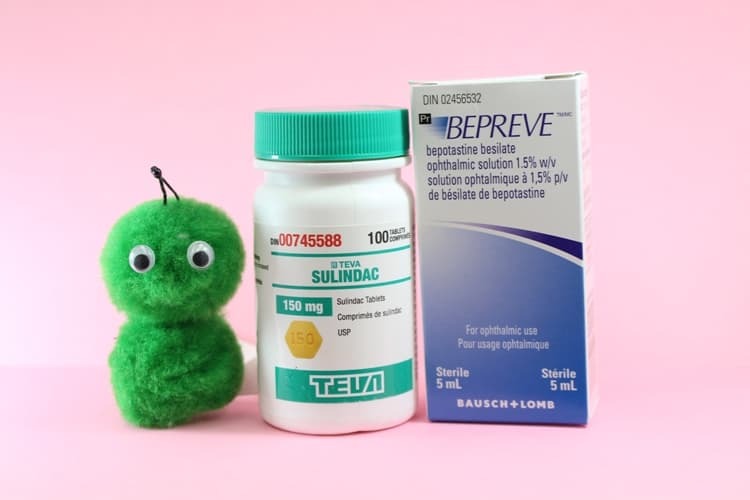 The generic and brand name medication do come with a potential risk: sulindac has been known to cause a rare skin disorder known as SJS (or Stevens-Johnson syndrome). Used for: Zykadia is another anticancer medication, and it’s also used to treat non-small cell lung cancer once it’s spread to other parts of the body. It’s used only if the tumor growth contains a specific genetic marker. It works by interfering with the growth and spread of cancer cells throughout the body. Used for: Gilotrif is the final anticancer medication for 2017 that’s been approved to treat non-small cell lung cancer once it’s spread to other parts of the body. The cancer must contain a specific genetic marker before this drug will be prescribed. It can also be used to treat squamous non-small cell cancer that has spread, and has not been successfully treated with other medications. It works by interfering with the growth and spread of cancer cells throughout the body. Used for: Solystat is a cation-exchange resin and is used to treat high levels of potassium in the blood – also known as hyperkalemia. It works by binding to potassium in the intestine to lower the levels absorbed into the blood stream. Used for: Viberzi is used to treat irritable bowel syndrome (IBS), with the main symptom of diarrhea. It’s used to slow the movement of food during digestion and makes the nerves in the intestines less sensitive to stimulation. Manufactured by: Gilead Sciences Canada, Inc.
Used for: Epclusa is a combination antiviral medication used to prevent the spread of hepatitis C. It may also be given in combination with ribavirin for people who have advanced cirrhosis. 2017 has brought in a number of medications for treating cancer, and more specifically, non-small cell lung cancer. There are also a number of new medications to treat arthritis, psoriasis, and more. As medications advance, our pharmacy continues to provide affordable options to those who seek to keep costs low. Contact us today at 1-866-920-3784 to discuss your prescription medications and learn about how we can save you more on the medications you need most.